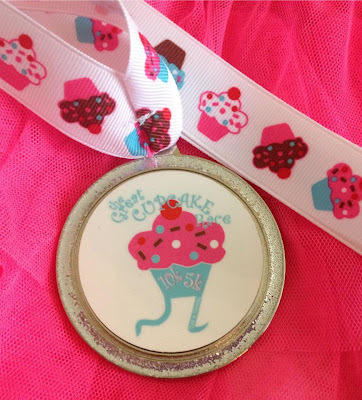 Running In Sanity: The Great Cupcake Race Update! The Great Cupcake Race Update! So, from what I gather on Facebook, everyone loves the medal! I'm so happy with it, and I can't wait for all who have registered to get it in the mail, it will be sure to make you smile! For the update, we have 81 people registered as of today at 5:25 pm! 25 out of 50 states are represented- Florida and Texas are tied with 10 in each state. We also have runners in Canada and Japan! We have 60 medals on hand (our first batch). Registration will close on 8/30/2012 at midnight EST. We will place our order for our second batch first thing 8/31 and will have them within a week (we are working with a great local company) and they will go into the mail the next day. Again, I am so appreciative of your support, The Great Cupcake Race has been a bigger hit than I ever imagined! Thank you to everyone who has registered, shared the event and even convinced someone else to register to run with you! I am really looking forward to seeing everyone's pictures when they finish! Especially if you celebrate with a cupcake! All signed up! Assume you get our address from the PP payment? Let me know if you need something else. Best of luck! The Great Cupcake Race Winners! The Great Pumpkin Race Registration Now Open!